1500 feet above the ground surface is where our suite of instruments normally operates, but for this flight we are taking them up higher, much higher, in fact over 20 times our normal range to 33,000 feet. Our flight plan is to repeat lines surveyed in a previous years by NASA’s Land, Vegetation Ice Sensor (LVIS) a scanning laser altimeter. 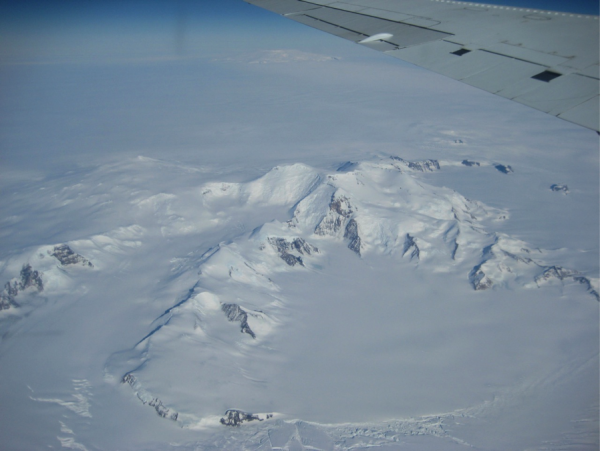 LVIS has collected data as part of the IceBridge instrument suite in the past, but it was flown separately at high altitude on its own plane, in order to map large areas of both land and sea ice. This flight will refly some of LVIS’s work but using a subset of the instruments on our plane, narrow swath-scanning lidar, the digital mapping camera system, the gravimeter, and our depth radar. At our higher elevation we will fly faster and can cover a lot of ground. The landscape of Antarctica can be hard to get ones head around – a glacier catchment is usually too big to fit into one field of view, so we see it bit by bit, and try to build up a physical picture in the same way we build up our understanding of the system – piece by piece. We have flown several missions into the Amundsen Sea region on the west Antarctic coast in the past, but this was the first time where we could really see the context of all of these different glaciers – flowing into the same embayment, forming ice shelves, calving ice bergs, and drifting northwards through the sea ice. 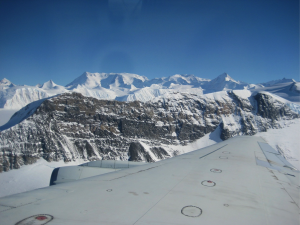 The flight offers views of some of the most noteworthy features in Antarctica. Pine Island Glacier, one of world’s fastest streaming glaciers, developed an 18 mile crack along its face in the fall of 2011 which spread further over the last few months. The crack will inevitably lead to breakage, dropping an iceberg which scientists have estimated will be close to 300 pound in size. 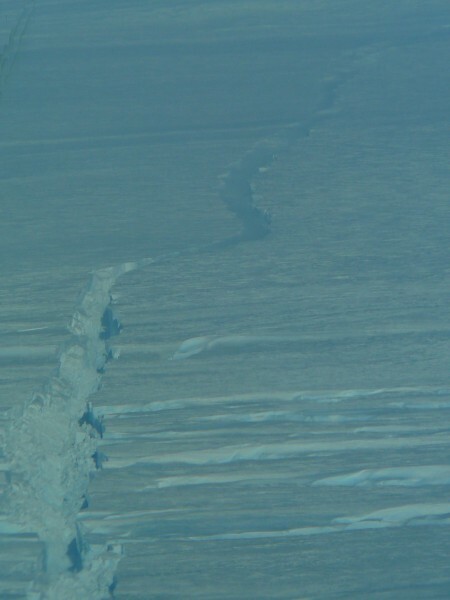 Crack along the front of the Pine Island Glacier as seen form the IceBridge forward facing camera. Bordering the glacier is one of two shield volcanoes we passed over during our flight. Pushing up through the Antarctic white mask, Mount Murphy diverts the ice streaming along the glacier. A steeply sloped massive 8 million year old peak, Mount Murphy pulls my thoughts back New York as it was named for an Antarctic bird expert from the American Museum of Natural History. From Mount Murphy we continue to the second shield volcano, Mount Takahe. Ash from 7900 years ago found in an ice core from the neighboring Siple Dome has been attributed to an eruption from this volcano. This massive potentially active volcano is about 780 cubic kms in size. The volcano was named by a science team participating in the International Geophysical Year (1957-8) after the nickname of the plane providing their air support …an unusual name for a plane as its origin is that of a plump indigenous Māori bird from New Zealand which happens to be flightless! Regardless the rather round Mount Takahe soars high above the glacier as we move overtop. Travel to the Ronne Ice Shelf involved passing by the Ellesworth Mountains. 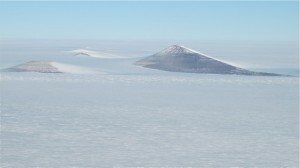 The range contains Antarctica’s highest peak, Vinson Massif at 4897 meters of elevation. Named after Edith Ronne, the first American woman to set foot on this southern continent, the Ronne Ice Shelf is tucked just to the East of the Antarctic Peninsula on the backside of the Transantarctic Mountains. With an area measured at 422,000 square kms, this is the second largest ice shelf in Antarctica. 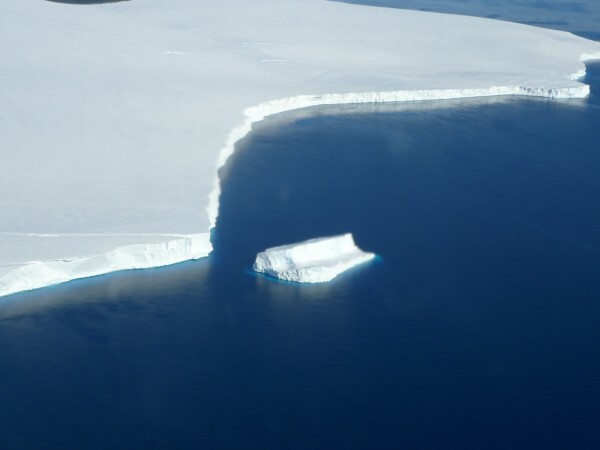 This vast icy expanse stretches into an indentation in the Antarctic coastline called the Weddell Sea, and gained some attention this past spring when scientists identified a mechanism that will force warming ocean water up against Ronne, which over time will cause it to thin and weaken (Hellmer, H. H. et al., 2012). Ice shelves are important barriers slowing the flux of ice moving off the land into the surrounding ocean. Any weakening in the tight connection of this ice to the land, either at the bottom where the shelf freezes to the ground below or where at the edges where it is tightly fused to the continent, can have major impacts on the speed and volume (flux) of ice moving off the land and into the oceans. 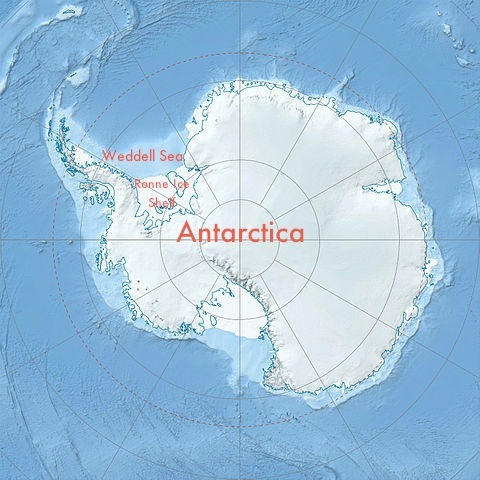 Annotated Antarctic map showing the area of study. The current mission is being flown to measure the flux of ice currently coming into the Ronne Ice Shelf from the surrounding Antarctic landmass. To determine this we focus on the ‘grounding line’, the area where the ice changes from being frozen solid to the land below to floating as part of the ice shelf. To understand how much ice is moving over the grounding line, we have to understand how much ice is at the grounding line, and to do this we have to fly along the grounding line (or slightly inshore of it). The majestic Ellsworth Mountains, formed about 190 million years ago, are the highest range in Antarctica, and steeper than the Tetons. Their original name, Sentinel Range, describes their posture, as they watch over the Weddell Sea and the Ronne Ice Shelf. In many areas of Antarctica, even knowing where the grounding line is takes a lot of work. Much of that work is done using satellite data through a process called “interferometry”. This process compares the returning radar signal from different satellite passes to determine where the ice begins to move under the influence of the ocean tides. In this scale, ice that is responding to the rise and fall of the tides is floating ice, and from this we can mark the grounding line. While technique identifies the grounding line, it does not show how much ice is moving across it; to determine that we need to collect ice thickness measurements. For today’s flight we moved just inland of the grounding line for about half of the Ronne Ice Shelf collecting ice thickness and other supporting data that will begin to fill in this important information. Reference: Hellmer, H. H. et al. Nature, 2012. DOI:10.1038/nature11064. 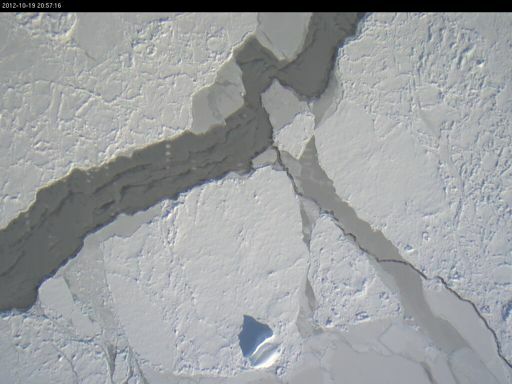 Sea Ice on the left, touching up against an ice shelf along West Antarctica. (Photo from the camera in the belly of the plane). The plane is flying at ~1500 ft. of elevation – the estimated field of view is ~450 meters. 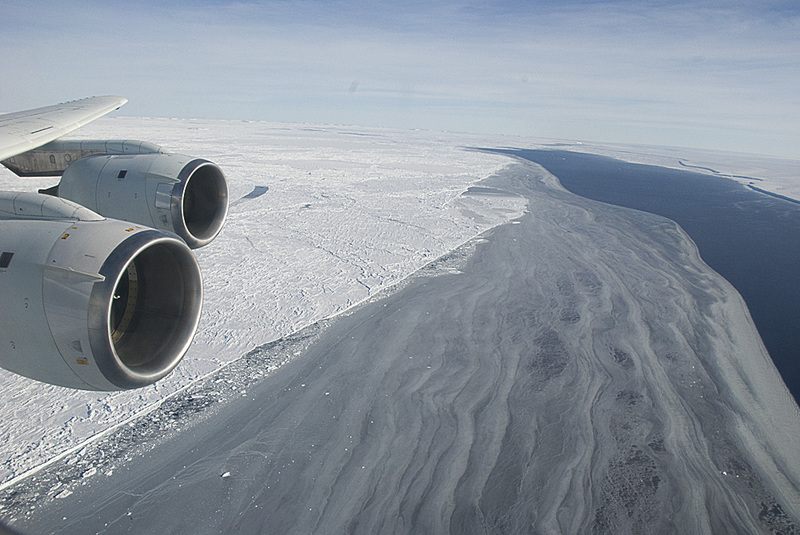 One piece of our IceBridge mission focuses on sea ice here in the south. Sea ice in the northern regions has been reducing at dramatic rates over the last decade, setting a new record just this year, but the story in the south is not so clear. In fact, there has been a buzz that Antarctic sea ice extent may just be increasing while the Arctic ice is decreasing. The issue is a complex one and involves not just sea ice extent (how much surface area the ice covers) but sea ice thickness (total volume of ice). While the extent of Antarctic sea ice is increasing, we also need to understand how the thickness is varying. 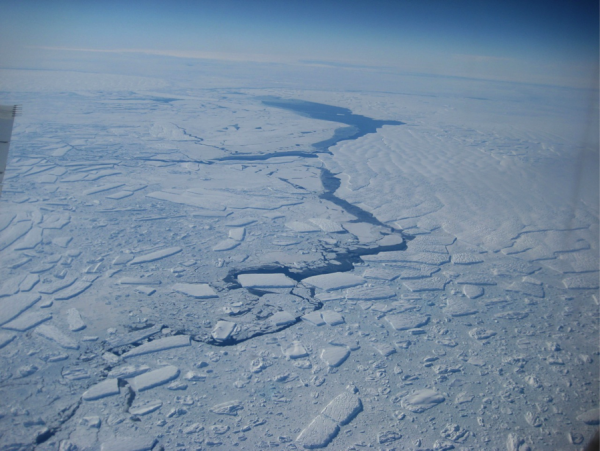 One of the trickier items in measuring sea ice is making the raw measurements of thicker and thinner ice. With only satellite measurements it is hard to get the true thickness of the ice, since the surface of the ice is often covered with snow that needs to be accounted for in our calculations. Using the snow radar on the IceBridge mission we can work out how much of what the satellite is measuring is actually snow. 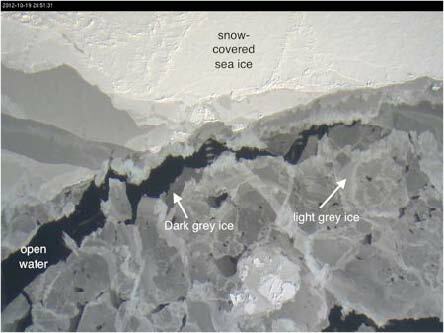 Bellinghausen sea ice labeled to show open water (dark areas), dark grey ice (less than 15 cm thick) and thicker light grey ice. 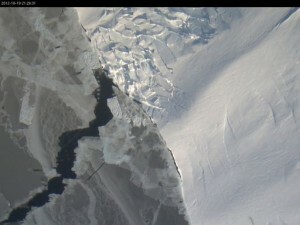 Image from the NASA IceBridge camera. The Bellinghausen Sea sits just to the west of the Antarctic peninsula and in the southern winter months is generally covered with sea ice. We have flown two Bellinghausen sea missions this season – one to map out to the furthest edges and another to looks at the gradient of sea ice change as you move away from the coast or shoreline. The second Bellinghausen mission was important because in running profiles in and out from the coast it allowed us to measure how ice thickness patterns vary with distance from the shore. We need to understand these patterns of ice thickness in the southern end of the planet, how they may be changing and what connection they have to the climate system. An pice of land ice that has separated as an iceberg (shows with a bluish coloring, approximately 30-40 meters in length) travels trapped amidst the floating sea ice in Bellinghausen Sea, Antarctica. There has been much less study done on southern sea ice than northern sea ice because we get very few opportunities to make the measurements we need. We have two high priority flights to the Weddell Sea (on the eastern side of the Antarctic peninsula), but so far it has not been possible to fly them because of the weather. Hopefully before the end of this season we will be able to fly both these flights and fill in more pieces in the sea ice story. 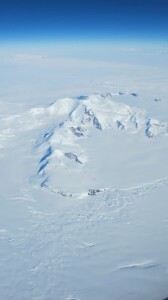 Last year IceBridge had its first flights into East Antarctica when it flew some missions into the Recovery Glacier area. Recovery is a section of Antarctic ice that lies east of the peninsular arm of West Antarctica, tucked behind the Transantarctic Mountains, a dividing line that separates west from east. We know from Satellite data that Recovery and its tributaries have a deep reach, stretching well inland to capture ice and move it out into the Filchner Ice Shelf draining a large section of the East Antarctic ice sheet. But there is a lot we don’t know about Recovery because the remoteness of the area has limited the number of surveys. Several recent works have showed us that this area is important. 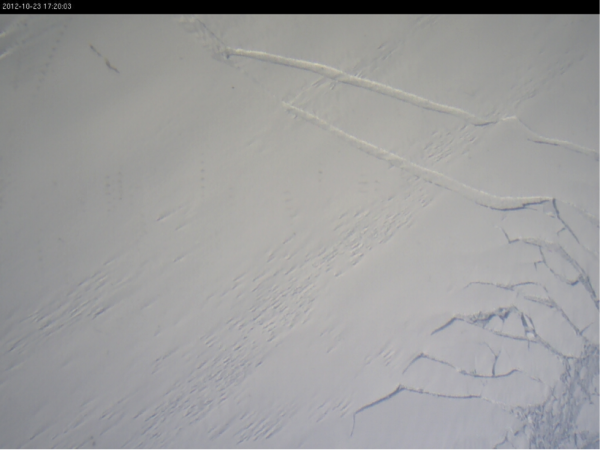 Satellite measurements of the ice surface show small patches along the trunk of the glacier that are changing elevation more than their surroundings. 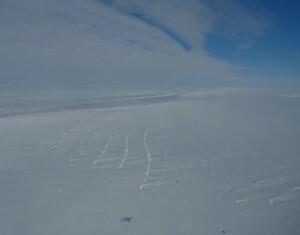 These patches have been interpreted as lakes that lie under the ice sheet, coined the Recovery Subglacial Lakes. The lakes appear to drain and refill over time as the surface elevation over the lakes changes. To learn more about them and what they might tell us about the behavior of the glacier, we need to look under the ice. But there is more we need to understand about this remote area, including simply needing to know the size and shape of the channel that delivers this ice out to the ice shelf and towards the Weddell Sea. 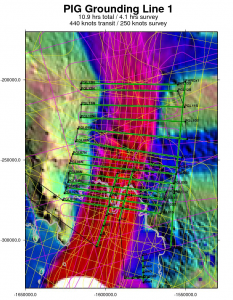 Last year’s mission gave us some data points to outline the channel, but this year will help us provide a more complete imaging of what lies below this East Antarctic ice conveyor belt. We will fly cross sections along the lines of the retired ICESat satellite tracks, allowing us to compare the laser measurements we make of ice surface elevation to those made during the satellite mission. We will end the day flying along the Recovery channel to get another look at one of the interpreted lakes. Combining last years’ data, ICESat data and this year’s data will give us a better picture of the area that has been carved beneath the Recovery glacier, the amount of ice that can be moved through the glacier and its tributaries, and how the lakes under the ice might fit into the larger story. 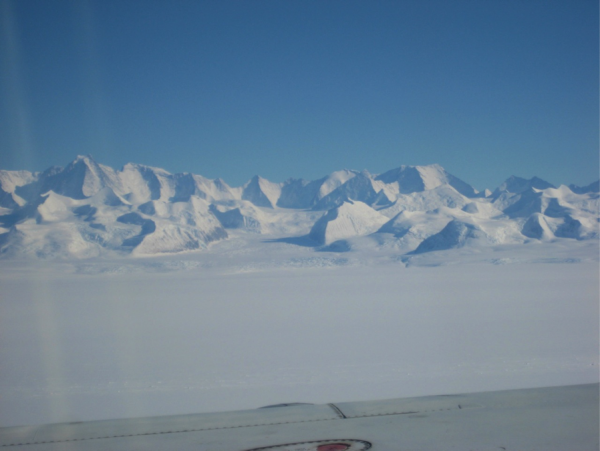 October 2012 IceBridge Antarctica resumes … Mission goal…monitoring the polar regions…Mission target… determine changes in ice cover and thickness, refine models for future sea level rise…Mission instruments…airborne geophysics. Good luck team. The crews have spent the last few weeks in Palmdale, where the DC8 is based, for instrument installation and test flights prior to our move down to Punta Arenas, our home base for IceBridge Antarctica. View from the DC-8 as it travels from Santigo to Punta Arenas. Clockwise from top left: forward camera, nadir (directly below) camera, forward bay, aft bay both filled with equipment and supplies. Instrument Run Down: We are flying with the same instrument suite as last year allowing us to see above, below and through the ice. Laser altimetry, for surface ice measurements, measured by the NASA Airborne Topographic Mapper, visible band photography, to allow for draped imagery, from NASA’s DMS (Digital Mapping System), three radar systems from Cresis to measure the ice thickness, composition and bed imagery (MCoRDS, Snow and KU band) and gravity to refine what is under the ice with Lamont using Sander Geophysics’ AIRGrav gravimeter. ATM and the gravimeter both require GPS base stations on the ground throughout the deployment. Combined with the GPS receivers on the plane these allow very precise positioning of the aircraft, and the sensors on board, which is critical to all the measurements we make. Setting up the GPS stations is one of the first jobs in Punta Arenas. It appears to be the paleo-shoreline from the last interglacial (~80,000 yr BP), when sea level was higher than present. 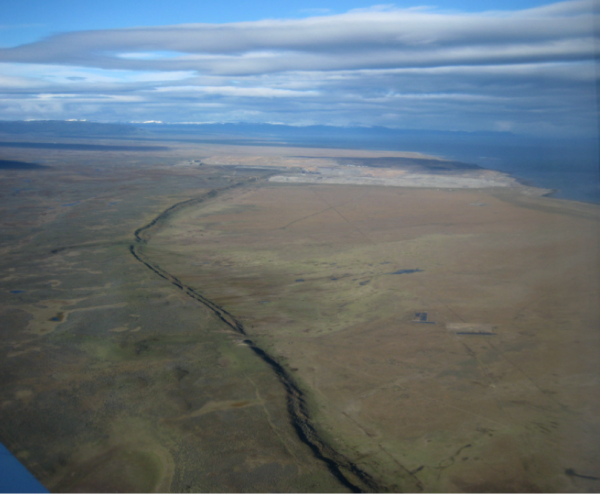 The very flat terrain results in any sea level change causing a large shoreline retreat. Evidence like this of changing shorelines, is one method scientists use to determine past sea level under a different climate. As we study different areas around the world, we must account for the local changes in how the land has risen or fallen. Changes in sea level can be a combination of an adjusted world/ocean wide (eustatic) sea level and the more local response from the rebounding (isostatic ) of the land that was previously depressed under a glacier as local ice is unloaded during deglaciation. Here the history of the shoreline was governed by a combination of changes in eustatic sea level and the isostatic response to deglaciation of the local ice load (De Muro et al. 2012). Putting together information from around the world we eventually build up a picture of the global changes that have occurred in sea level. Changes in sea level are directly connected to our work monitoring polar ice. When we fly over the ice, we are monitoring how the ice sheets are changing at present, and learning how to understand the complicated interactions between the atmosphere, the ocean and the ice. Studying this helps us to understand which ice bodies are most likely to contribute to sea level, how quickly they changed in the past, and how quickly they might change in the future. It’s good to get this reminder as we head out on our first flight – especially as it is to survey the area where the glacier switches from being frozen to the land below [the bed] to where it goes afloat, called the ‘grounding line’. 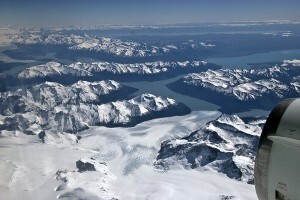 Our first flight of the season will be along the Thwaites Glacier. 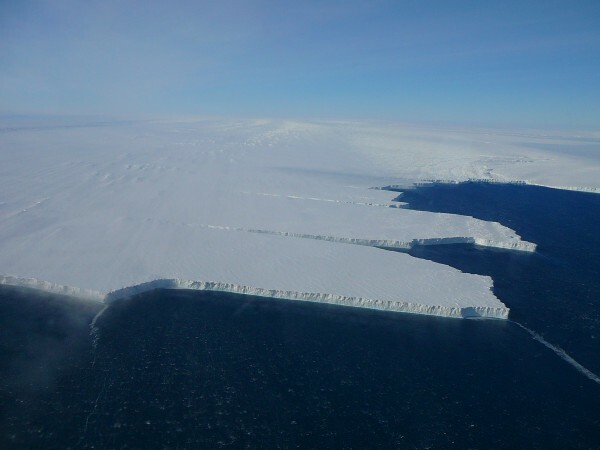 Thwaites and Pine Island Glacier are two ‘glaciers of interest’, both large outlet glaciers that serve as conduits out of the ice mass of the West Antarctic Ice Sheet (WAIS), moving ice off the land into the surrounding ocean, and long considered its Achilles heel. 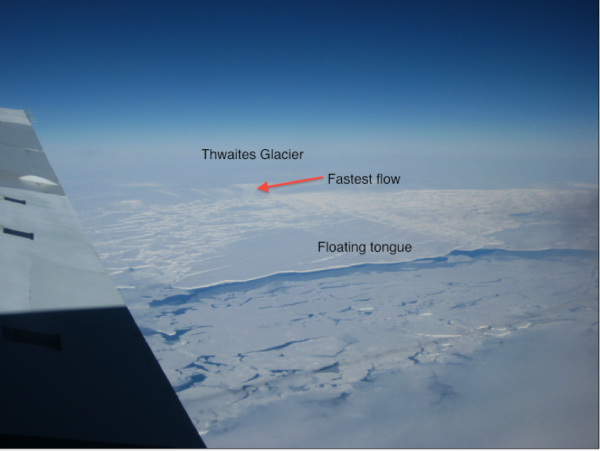 Thwaites glacier has a very wide region of fast ice flow over its grounding line, and a relatively small change in that width has the potential to greatly increase the flux of ice into the ocean. Through the radar and gravity measurements collected on previous IceBridge missions we have been able to get a sense of the bed shape tipping downward as you move inland from the ice edge, and where pockets of water lie under the icesheet. Our goal today is to collect enough data to develop a more complete image of what lies under the ice in this area. Image of the inward sloping bed, and the ice front pinning to a rocky ridge. From: Tinto, K. J. and R. E. Bell (2011), Progressive unpinning of Thwaites Glacier from newly identified offshore ridge: Constraints from aerogravity, Geophys. Res. Lett., 38, L20503, doi:10.1029/2011GL049026. 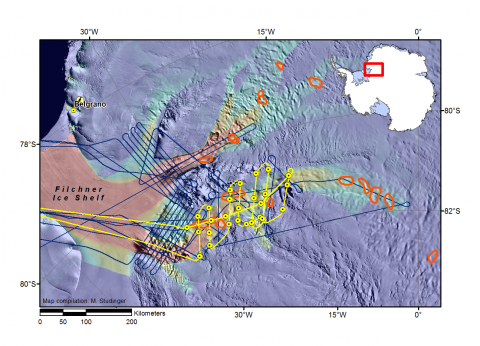 2009 Operation IceBridge surveyed a grid in front of Thwaites grounding line and identified a ridge in the rock of the sea floor. In the last few months a large section of Thwaites glacial tongue broke off just seaward of that ridge. 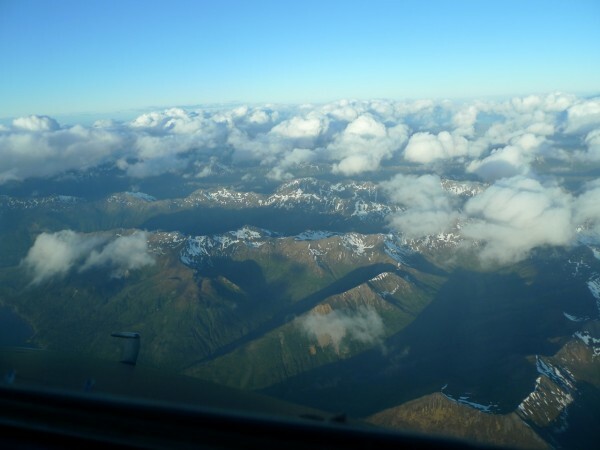 This mission will fly back and forth along nine lines parallel to the grounding line of Thwaites glacier. In combination with flights from previous years, this will give us a map of the grounding zone at 2.5 km spacing. We are hoping to learn more about goes on underneath this icy reach of the Earth each time we take flight. As little as a few decades ago you could ask a scientist what it was like to monitor the changing ice in Antarctica and the response might have been “Like watching paint dry” — seemingly no change, with no big surprises and not too exciting. Well times have changed. The Ice Bridge Mission is deep into its third Antarctic season collecting data on the condition of the continental scale ice sheet and the floating sea ice that surrounds it, and has noted some exciting results. 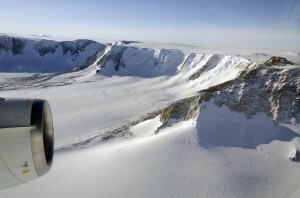 On a recent survey flight, which was designed to be fairly routine flying back and forth across the main trunk of Pine Island Glacier, a large crack was spotted in the floating ice tongue in the front of the glacier — a crack large enough to bury a building 16 stories high. This means more changes are coming in the future of this active ice stream. 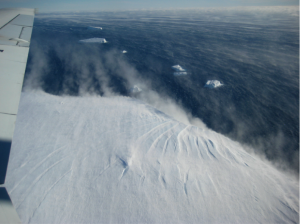 Pine Island Glacier has been under intense focus as one of the fastest moving, and rapidly thinning glaciers in Antarctica. The planned survey was a grid back and forth across the main trunk of Pine Island Glacier. 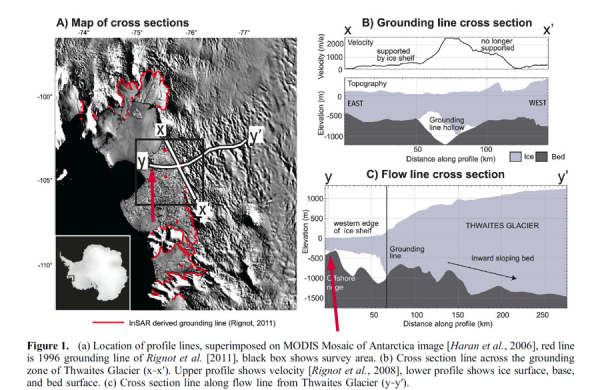 The pilots refer to this kind of survey as “mowing the lawn.” This type of data collection is essential for putting together a more complete “picture” of the glacier surface, depth, and its underlying surface, and its “grounding line.” The grounding line, shown here as the white line running through the image of the survey plan, is the front edge of where the glacier is frozen all the way to the bottom surface beneath it. 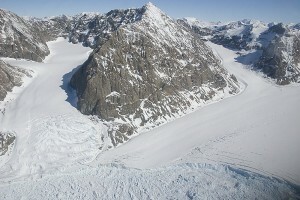 The glacier extends beyond the grounding line but as a “floating tongue” of ice. Glacial tongues can be many meters thick, but because they rest on water they are susceptible to warming from the water below. It is not unexpected for sections of the tongues of glaciers to break off – in fact for this glacier scientists expect to see it occur about twice a decade (the last notable occurrence was in 2007). It is, however, impressive to see it actually developing, and to realize the scale of the crack as it begins – at least 50 meters deep, and up to 250 meters wide. Yes this is much better than watching paint dry. 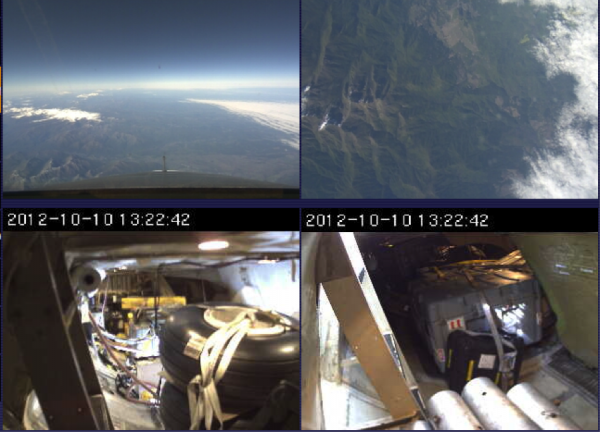 Lamont-Doherty Earth Observatory has been a partner in this NASA led project collecting airborne gravity. The Ice Bridge Mission is designed to fill the gap between two satellite missions, IceSat I and IceSat II, collecting data on ice thickness in both polar regions. IceSat II is intended to be in orbit in another 4 to 5 years. The IceBridge mission has been having trouble getting flights up recently, which we have been assured is par for the course in this kind of work, but still it is frustrating! Here we are down in Punta Arenas waiting…waiting…waiting. We have faced a series of weather related stoppages and then the normal issues with equipment repairs causing this season to unfold with agonizing slowness. We were, of course, spoiled by all our successes of the prior campaigns, when flights seemed to lift off with uncanny regularity! 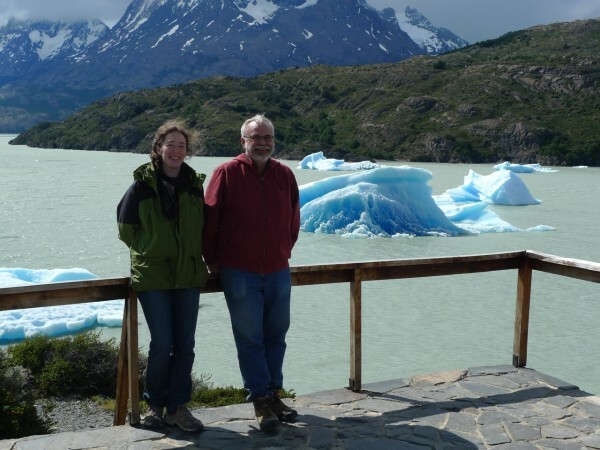 Kristy Tinto and Jim Cochran in Torres del Paine national park waiting for an 'all clear' to resume the mission flights. 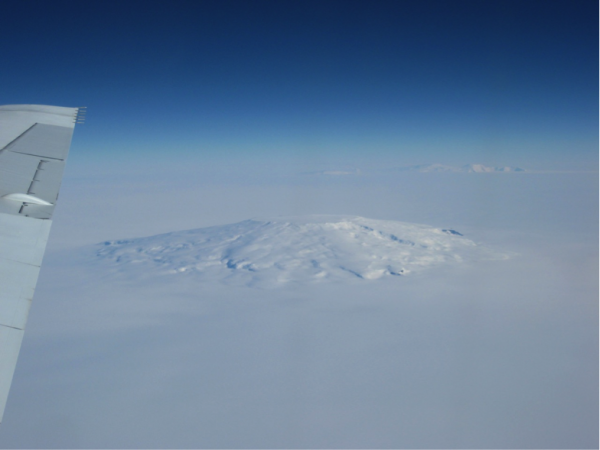 I was eager to be involved in these two flights along the Antarctic Peninsula as they were to survey the Getz and the Dotson ice shelves which involves flying over the Amundsen Sea and past Thwaites Glacier. 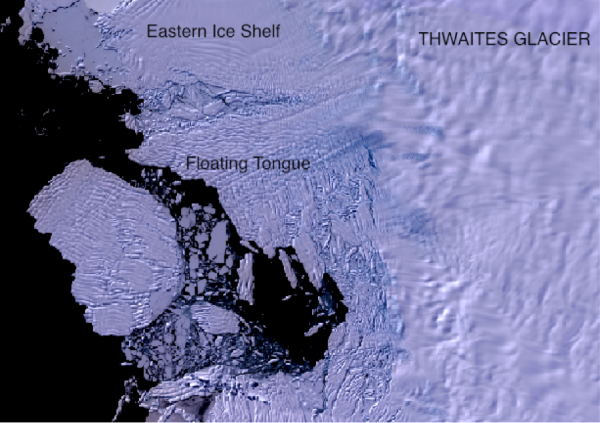 These floating ice shelves appear in a line, Thwaites, then Dotson, and then Getz (moving from the direction of tip of the peninsula downward). I have been working on data that were collected last year from the Thwaites area so it was good to at least be flying in the ‘neighborhood’. The Dotson flight was particularly useful for me, since the grid flown over it can be connected in to the Thwaites grid, extending my survey area and our understanding of that area. I hadn’t been on a science flight before, so everything was new to me. There is a network on the plane so we can all sit with our laptops and follow our position on the map, see where we are going, how high and fast we are flying, and other information. 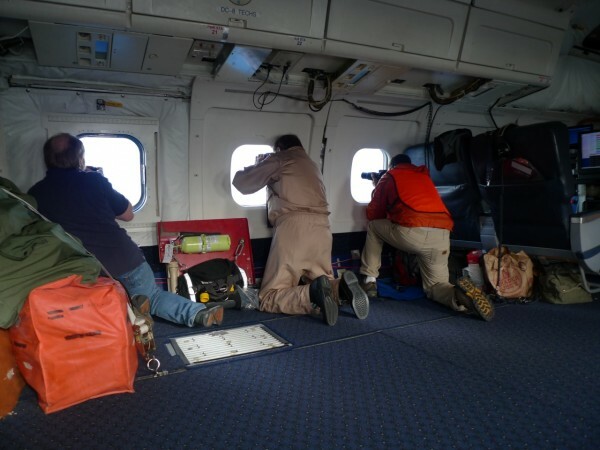 There are additional cameras looking forwards and downwards, so we have a wide field of view in addition to looking out the window (which we did plenty of!) (see image)! The different kinds of ice we flew over captured my interest…from icebergs in the open water, to big plates of sea ice, the expanse of flat, floating ice shelves and the crevassed glaciers. Each has a function in the polar region and studying the movements, expanse, depth of each can tell us a different piece of information about our changing polar region. There was a lot of variation in what was all essentially ice. For this flight, however, the targets was ice shelves, where the ice is floating on the sea. Collecting gravity data, which is Lamont’s role in this project, is important on these surveys because while the other instruments can measure the top (laser), bottom and internal surfaces of the ice (radar), they don’t “see” all the way down to the sea floor. The gravity measurement is controlled by the bathymetry of the sea floor, as well as by changes in geology, so we can use it to model the sea floor. Knowing what is under the shelves, how the ice is “hinged” to the continent, and how the ocean water beneath is coming into contact with the ice flowing off the continent is important to understanding how that ice might melt or move in the future. On the trip home, I sat in the jump seat in the cockpit, a real treat! We flew back in to Punta Arenas over vegetated valleys, the landscape still marvelous but very different from how we had spent the day (see image). Measuring the Ice From a Bird’s Eye View! 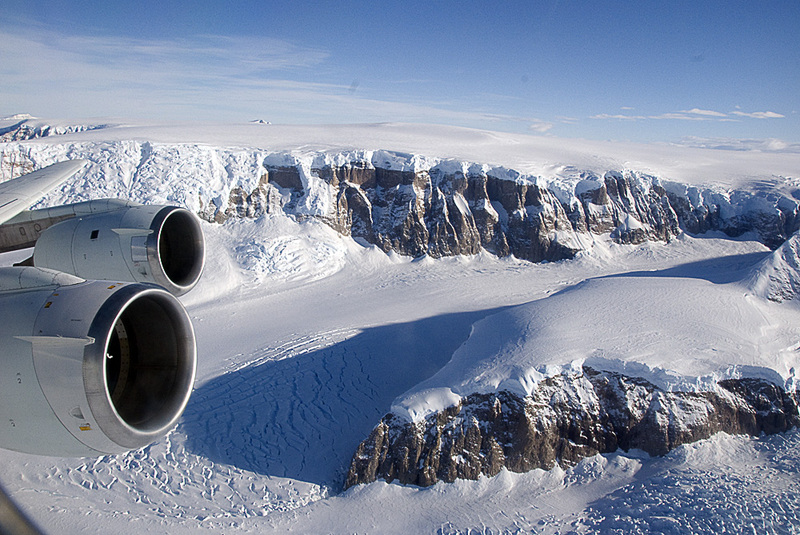 Operation IceBridge Antarctica ramps up for a second year of ice surveys. Originating from Chile, a series of airborne missions will be flown almost daily from the airbase in Punta Arenas. 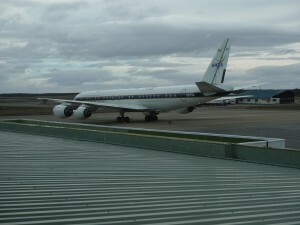 Using a DC-8 jet airliner, the flights will run up to 11 hours each as they cross Drake’s Passage and the Southern Ocean to reach their destinations of monitoring Antarctic sea ice, the Antarctic peninsula and the western edges of the continent, before returning back to Chile each night. Flights will include some low altitude (~1,500 ft.) flights, and a few high altitude flights (~35,000 ft.). For this season we will re-fly some of last year’s lines as well as adding some new locations to the flight plans. 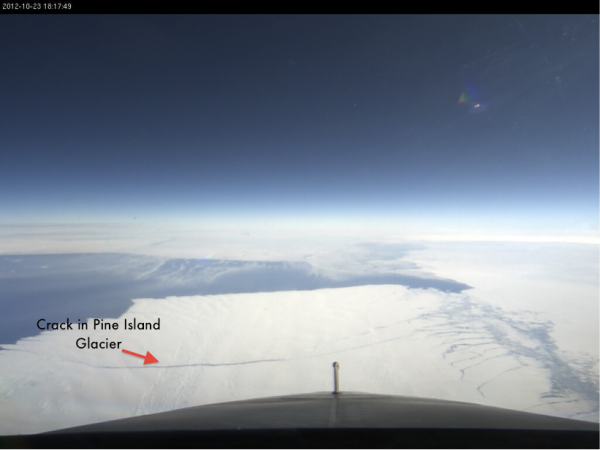 One area to be resurveyed is an area of ongoing change – the Pine Island Glacier. This year the project design includes flying further back over the major trunk of the glacial ice stream in order to better understand the broader glacier dynamics. The sea ice flights are also of interest to the science community since Antarctic sea ice, unlike Arctic sea ice, is actually growing in extent. Developing a better understanding of why this might be occurring is extremely important to understanding the full Antarctic climate dynamics. The instruments on the plane include laser to map and identify surface changes (Laser Vegetation Imaging Sensor [LVIS] & Airborne Topographic Mapper [ATM]), radar to penetrate through the snow/ice and image below providing information on the bedrock support and internal ice characteristics, and gravity to measure the size and shape of any ocean water filled cavities at the outlets of some of the main fast-moving glaciers. Before embarking on the actual mission, test flights must be flown to check each instrument. The five-hour test flights cruise over and around the Mojave desert, with different flight lines planned to test different instruments. To me the most exciting was a ‘pitch and roll’ over Lake Mead for the LVIS scanning instrument to collect surface topography data. The pitch is like putting the plane on a seesaw and tipping it forward and backward – which feels very impressive, and shows up in the vertical acceleration felt by the gravimeter and the butterflies in my stomach! The roll maneuver involves flipping the plane side to side (although not all the way over), and looks very impressive out the window! The instruments performed well so we move on to Chile. The DC-8 carries 40 passengers and the seats are pretty big, so after a comfortable long-haul flight we spend Wednesday setting up the ground station – a hut where LVIS, ATM and gravity all have GPS antennae set up outside – and getting the gravimeter ready to measure. Our gravity team includes Jim Cochran, and me from Lamont and Kevin and Sean from the Sanders gravity group. Because the gravimeter must stay plugged in at all times, by NASA guidelines it must be monitored round the clock. We switch on and off this duty and every six hours swap generators and refuel. Easy. However the wind is blowing 76 km/hr, and gusting to 94 km/hr, so walking out to the plane is a challenge. The good thing about Punta Arenas is that there are not many things blowing around – anything not tied down blew away a long time ago! For the first time in more than 40 days, the nose of the NASA DC-8 is pointing north after taking off from Punta Arenas airport. We have completed our Antarctic survey flights and are heading back home to Palmdale, California. But before we start climbing to cruising altitude we are flying at 300 ft above the Strait of Magellan just outside Punta Arenas to collect atmospheric chemistry data. After two passes over the strait, we head north towards Santiago and enjoy the spectacular view of the Patagonian Ice Fields and the Torres del Paine from 35,000 feet. Over the past five weeks, the ICE Bridge teams have collected a landmark data set over Antarctica. We had originally planned to fly 17 missions but actually accomplished 21. We have flown more than 155,000 kilometers or almost 100,000 miles. This is almost four times around the world in 40 days. During this time, we collected high precision measurements of the ice surface elevation of many glaciers and ice shelves in Antarctica. We have also mapped the thickness of the glacier ice and snow cover, have measured the freeboards and snow thicknesses of the sea ice in the Weddell and Ross Seas, and have collected gravity measurements that will allow us to estimate the water depth beneath the floating glacier tongues. We have collected an enormous amount of data and are keen to analyze it with our colleagues when we are back in our labs. From the analysis of this data we will gain a much more detailed understanding of how the glaciers, ice sheets, and sea ice respond to changes in the climate system. A project of this size is only possible with the support of many people. We could not have done this without the help and support of our Chilean friends and colleagues in Punta Arenas and Valdivia, the airport and hotel staff, and the many NASA and university people back home who have worked long hours to make this project happen. We thank NSF for giving us access to their forecasts, and help and assistance from the forecaster at the British Rothera Base (thanks Tony). For planning our flights, we also acknowledge our use of and dependence on the UCAR/NCAR NSF-supported Antarctic Mesoscale Prediction System. We had terrific aircraft crews both in the air and on the ground as well as excellent science teams. We all had a great time in Punta Arenas and are looking forward to come back next year for another ICE Bridge campaign over Antarctica. 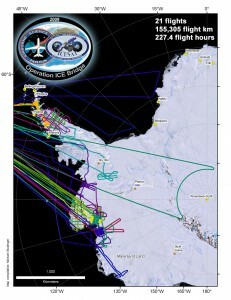 Map with flight lines of the Operation ICE Bridge 2009 Antarctic campaign. PUNTA ARENAS, Chile–The weather forecast for our survey over the Larsen C Ice Shelf looks good. Given the difficult weather over the past couple of days this is a welcome change. After studying satellite images and computer models and talking to the meteorologist at the Punta Arenas airport we decide to fly. We will follow the flow of ice from Antarctica’s interior to the ocean where the ice breaks into icebergs and eventually melts. 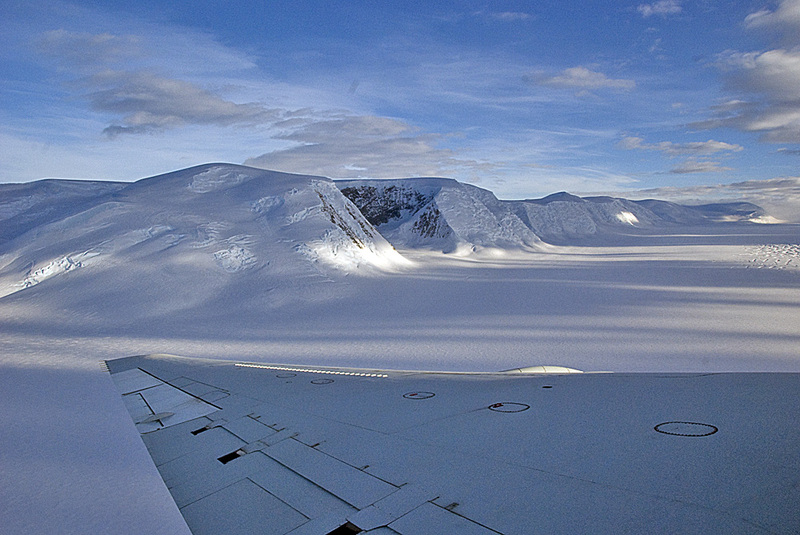 The flight will take us through an almost complete tour of the Antarctic cryosphere. Our tour begins over the small ice caps of the Antarctic Peninsula. The snow and ice that forms these ice caps eventually flows downhill through steep valleys, reaching glaciers and ice streams. I am seated in the cockpit behind our two pilots to get a better view of the scenery. We are descending into a steep valley filled with ice on its way to the remnants of the Larsen B Ice Shelf that broke apart a few years ago. The ice here forms a huge floating surface that appears endless. Warm seawater lies below the ice; we are here to study how it melts the ice shelf. The ice flowing into the valleys is pushing the ice shelves away. Eventually huge ice chunks break off to form icebergs. Our next survey line takes us to the edge of the ice shelf where several gigantic icebergs can be seen floating in the distance, along with pools of open water. After crisscrossing what’s left of Larsen C we head back to the crest of the Antarctic Peninsula and repeat a different survey line. Each time I look out of the window I see a breathtaking but fragile landscape. Our tour ends at the edge of Larsen C Ice, where sea ice meets open water.